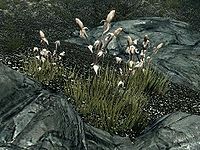 Grass Pods are harvested from Spiky Grass plants that grow along Skyrim's northern coasts and along the rivers around Morthal. It is one of only three (four with the Dragonborn add-on) ingredients with a Fortify Alteration effect. This page was last modified on 9 April 2018, at 04:42.